We all know that comic books are pretty popular in Japan among adults and mobile phones even more so, which is why one major publisher is putting the two together to launch the first subscription comic specifically for phones. Japanese publisher Shinchosha has just announced an imminent new title called ComCom, which will deliver 200 pages of the finest in Japanese graphic art each month to mobile phones. By finest, we mean in terms of lots of gore and doe-eyed heroines in (and out of) miniskirts, of course. The ¥350 a month manga, also known as Com2, will be available to users of the three major phone networks, although will be only in Japanese at first. Shinchosha says it will eventually offer translations in Chinese and English that can be read on the regular internet. 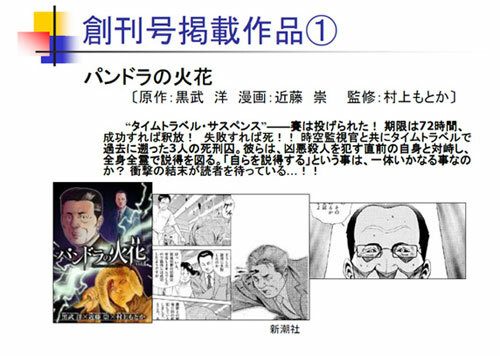 Text-based novels that are delivered in daily or weekly installments have already rocked the Japanese publishing world to the extent that there’s even a prestigious prize for the author of the best such work. Last year’s winner of the first Japan Mobile Phone Novel Awards was ‘Clearness’, the tale of a schoolgirl prostitute. Well, it is Japan.